yeah cromax two less injectors but they are larger injectors. I'd say purely a cost cutting exercise less parts and complexity. huh? Wait a minute ... you've confused me! 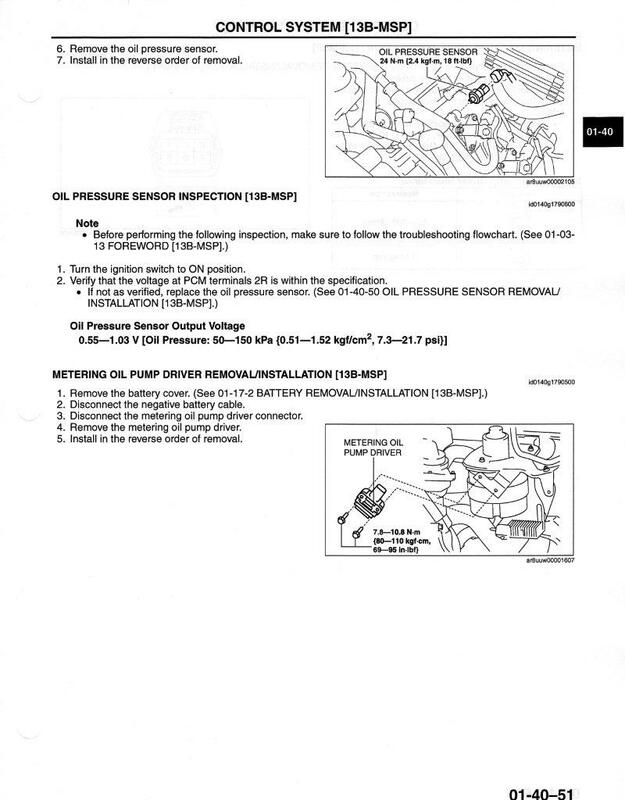 Are you saying the 2009 6 port engine only has 4 fuel injection nozzles and the 03-08 on had 6? On a side note, I really don't see why you'd buy a new one if you had a series 1, as the improvements on the series 2 are only minor and the car looks ugly in comparison. Minor improvements, matter of opinion. If you call a better gearbox, better apex seal lubrication which may prevent a rebuild, improves rear suspension, better air flow to oil coolers, diff ratio, plus others already mentioned. I guess beauty is in the eye of the beholder, personally I love the look of my car, has way more class than the previous model...which I think can look tired. I really think it all depends on the colour. The VR in series I looked great in series II it looks crap, because of the top grille. In the white or black you don't notice the "mustache". Every day I get lookers gawking at my car. If I had the choice of the two, I would take series II because of the improvements, the car maybe 0.5 sec slower and use a little more gas, so they say, but for me the car is sorted, as I said before this 8 is a good as it gets. Did they fix the issue of the random rattles of the rear door / window? Not a rattle in mine yet, I will let you know when a lot more miles have been put on. how did they make it slower? the diff and gearbox should give the series II an advantage. is it heavier or are they just being honest about the power and performance these days? the 8 is great but the chassis is so much more than the NA can provide. if mazda would only force feed the 8 then I would buy a new one! It's only a tiny bit slower in the 0-100* time because of the need for an extra shift into 3rd gear. Lap times are actually better. Not sure if that's because of the suspension tweaks or maybe better tyres. Are there better tyres? See, I said tyres. *That's 0-60 for us 'Yanks stuck in a 19th century measurement system', but you penal colony in-mates are still measuring time in hours so I don't know what the big deal is! Rob, mine has RE050A's, from RE040's. Thanks, I thought I'd heard somewhere that the tires were upgraded a bit. Where do you feel the handling differences? Would you notice something like better track times? Taken from my Series II (see Avatar) the oil coolers are 240mm wide by 205mm tall, or 9 & 1/2 inches by 8 inches. Lose about 20% because of actual air flow opening due to the vents styling. Yes there are two oil coolers now for the Australian Spec (Auto and Manual). At a guess I assume the coolers are about 20% larger than Series I. Thanks! If no one else knows, I'll go measure my Series I coolers when it gets warmer. BTW, it's cold up here in New Jersey now, not warm and sunny like in the penal colony. You'd think one of you in-mates might go out and measure your Series I coolers, but no, sit around drinking Fosters and wait for me to do it in April maybe. I really don't think you would see much difference at all, perhaps Bridgestone have addressed the "noise", I think these Tyres are 'rated' to go a little faster than the 40's, plus BS don't make the 40's anymore which are a Jap import here. Last edited by ASH8; 01-02-2009 at 05:19 PM. Most of we convicts are still asleep! Hang on it is 10.12am sat morning! Probably still hung over from all the Fosters. Thanks! Make that COOPERS (Beer) thanks!, better than Fosters CR*P! If you are into Beer and I am not, try Coopers, you should get it there, that is what you call a beer. Thanks. I know Australians think Fosters is crap, but its a lot better than most American beer, haven't tried Coopers yet. I lived in Belgium and Germany for many years so I have developed a taste for something better than American swill. the belgium's know how to make a beer! leffe is one of my favorites. Here is some discussion on the injectors change. As for tyres the change to RE050 is all that is being talked about. Its a newer tread pattern, newer materials, etc. They are still 225/45/18 (Or 225/40/19). 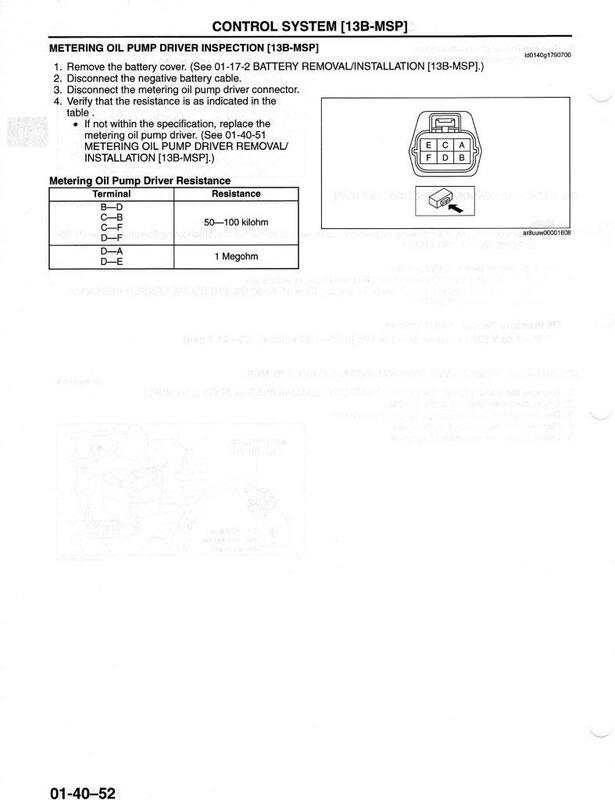 In the Series II RX-8, there are the all new Electric Metering Oil Pumps, yes Pumps. They replace the single mechanical MOP Mazda has used for the past 40 years. There are two electric metering pumps that sit on top of engine almost dead centre, both are joined together via an oil supply hose. It appears these pumps are not serviceable, although as yet I can't confirm this. There is also a Metering Oil Pump Driver located next to/on the electric air pump. Note: I am not sure why you would have to drain engine coolant to service the MOP?. Last edited by ASH8; 01-02-2009 at 10:18 PM. 225/45R18 (91W) on my car , I guess 225/45R19 for the R3/our GT. They are RE050A's (not RE050) which are the Asymmetric tread pattern. Yep that would be right about the 19's. And yeah I was being lazy leaving off the "A". But as I was getting at, the model of tyre is the only difference unless you count 19's on the GT. As for the new OMP, looks like it would be a WHOLE lot easier now to run a line from the pump to a seperate canister so you can run 2 stroke for the pump and synthetic in the crank. the difference in the oil cooler intake opening is substantial. that is the first thing i noticed when i saw the car in person.. The opening in the front bumper but not the cooler itself? What about the airflow behind, etc. I guess it would be possible to run a separate canister with the new EOM Pumps as the feeder, would also be a very interesting observation on how much oil is exactly being fed/used by the 6 oil nozzles, rather than the guess work we currently have. Not sure if I want to be the first to try it though? Pretty sure its a calculated value in a table. Not sure there, I don't think there would be much difference, i.e,, if there was a larger gap behind the oil coolers then that would change the overall length of the car, and I don't think there is much difference there, only a few millimetres if any. 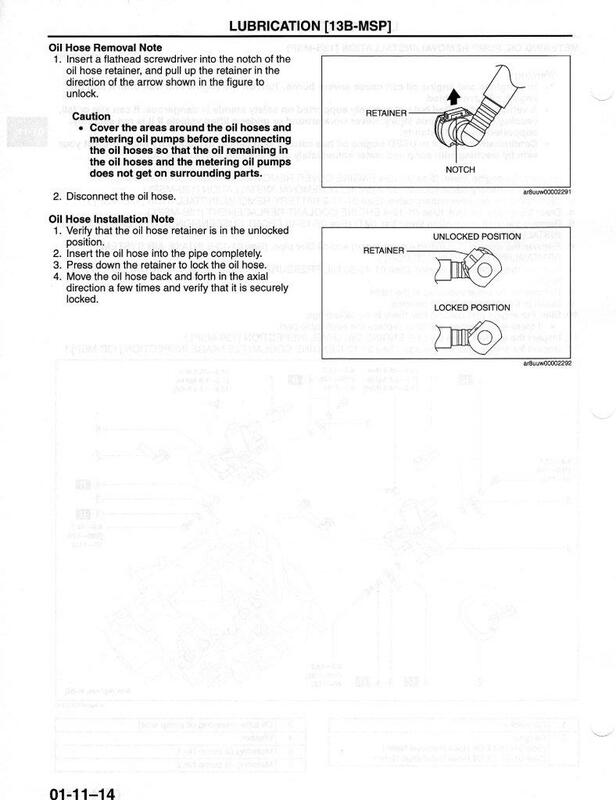 I also wonder why Mazda opted for two EOM pumps? and not one? The center of the apex seals require more oil then the outer edges. However the amount the center requires may not always be proportional to the amount required at the outer edges depending on rpm or load. As these increase, the center of the apex seals get hotter at a faster rate than the outside edges due to intertial forces acting on the seals. 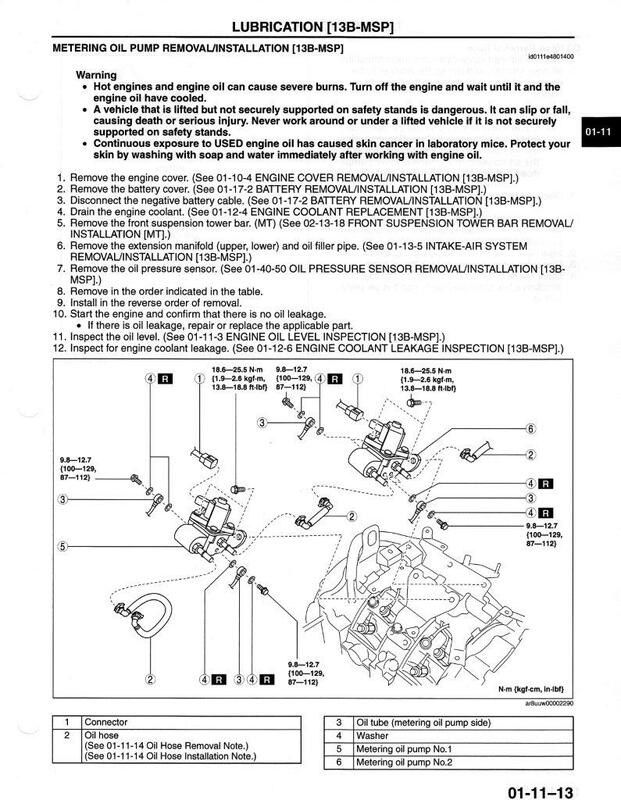 This was actually shown in a Mazda SAE paper from long ago which was pretty interesting. Not if they moved the oil cooler forward. I will do some digging but any handy links would be great.